Here’s a salad recipe that’s hearty, quick and satisfies even the pickiest of eaters! 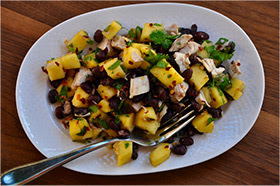 With tender, roasted chicken, flavorful black beans and sweet, tangy mango, this salad hits every flavor note without guilt. Whether you’re making a quick dinner, a lunch-to-go, or serving up a meal for company – this salad is truly a winner. I hope that you get a chance to give this recipe a try soon! Remember that I’m only a call or email away to assist you in all things health & fitness. And if you are not yet one of my prized clients then call or email me now to set up on interview. We have our next 6-week challenge starting March 12th– I’d love to help you achieve your best self!